The Singleton of Glendullan Game Of Thrones Edition is a Speyside single malt, representing House Tully and showcasing its leaping fish sigil. House Tully’s ancestral keep, Riverrun, spans the junction of the Red Fork of the Trident and the Tumblestone River. Ruling as Lord of the Riverlands, under the house sigil of a silver trout flashing above rushing water, House Tully embodies the surge of the rivers among which they live. With the determination of river waters that never cease moving, they formed powerful alliances and fight against the current for family, duty, and honor. 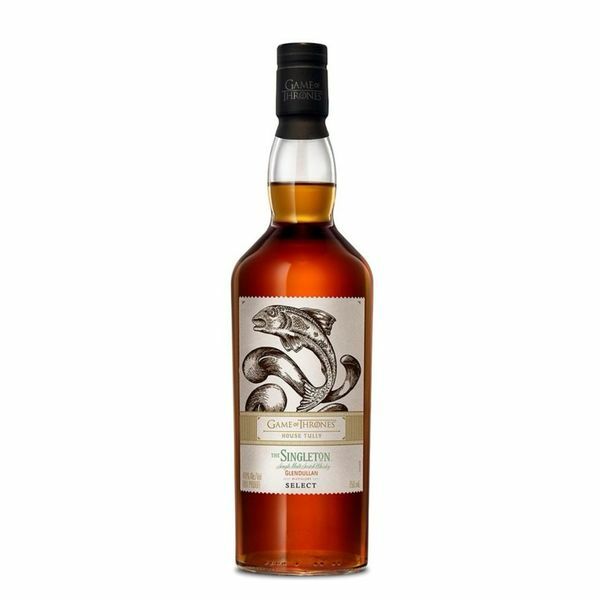 Situated on the banks of the River Fiddich in the wooded hills of Dufftown, Glendullan originally relied on the waters that surrounded it. Harnessing the force of the waters that flowed through the land, it utilized a water wheel to power the entire distillery. Best served with a splash of water, this Scotch has notes of green apple, honey and sweet vanilla and finishes dry and clean.